« Bigfoot Not Dead. Bigfoot Author. Bigfoot Celebrity. I have been meaning to post about my Creative Zen for a long time. But I hadn’t used it for a while so I didn’t think of it again until just recently. We are getting ready to go on our 20th anniversary trip to Thailand and the Zen is a great device to use on the exceeding long (24 hr+) plane ride. The battery can last 30 hours for audio or 5 hours for video. I have definitely watched at least 2 movies on it with 1 charge (I can’t remember exactly but it lasted for quite a while). Both the audio and video quality is extremely good. 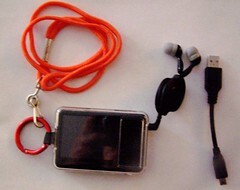 I have used it when taking road trips so I can watch videos or listen to music or audiobooks. It keeps any photos and will display in slideshows of your choice so it is also works as a small digital picture frame. It plays FM radio stations and has a date/time. clock/alarm, and an organizer feature. It also has a microphone for recording notes and things. This is my Zen. It came with the short mini USB to USB cable. I believe it also came with some earphones. I added a set of earphones that store very well without tangling (they pull out and lock and then zip back into the round case). I got them in a Brookstone store at the airport for about $25. I highly recommend buying the Creative Hard Plastic Case for Zen, Zen MX (Clear) to protect your zen. I attached a lanyard to mine so I can hang it around my neck. It is about the size of a conference name tag. I have the Creative Zen 4 GB Portable Media Player (Black) . It is not the latest version of the Zen nor does it have the most storage, even for the regular Zen. But it has everything I need or want. The Creative Zen X-Fi 16 GB Video MP3 Player with Wireless LAN and Built-In Speaker (Black/Silver) has wireless access, built-in speakers and improved audio. The X-Fi stands for Xtreme Fidelity Audio technology. You have to get at least the 16 GB version to get the wireless lan capabilities. It is described: You can now stream music and photos wirelessly from your PC to your player within a home network. With the Zen X-Fi, experience the sound of perfection wherever you go. Stay connected with friends on Yahoo Messenger or Windows Live Messenger on the go (at region-specific public wireless LAN hotspots). This is interesting sounding but I think it is a very basic access and not that worth it to me. It is easy to transfer files with mine and the rest doesn’t cut it since we have a Droid that does much, much more than that. I have the 4 GB version and I added a 2 GB SD card for extra storage. This is plenty enough for me. On the basic 4 GB drive I have 5 audiobooks, 9 full length movies and am loading a zencast video at the moment (to try it out). On the memory card I have about 55 pictures, 4 audiobooks and 2 movies and have about 550 meg left. I just have no need for more than this. On the Creative website they have a comparison of the different Zen players to help you decide which is right for you. Mine is not on there since it was the very first version. You can still buy them though. This is a picture of my Zen on a piece of paper to get an idea of its size. The bag is a bag I use to carry it and it’s bits in. It is just a small makeup bag. I like almost everything about my Zen. I think Creative is a good company that makes solid products. The one thing that is a little awkward with my original Zen is that the memory card is not integrated into the rest of the storage. In order to load it, you have to put the Zen on Memory Card/Removable Disk and then it connects as a regular drive. The regular drive on the Zen attaches to the PC with the different directories for videos, music (audiobooks), etc. The memory card has all the different styles of content all mixed in together and is not as well organized. In addition, I had a problem listening to my WMA (iPod compatible) audiobooks from it. It gave an error that it was copy protected. 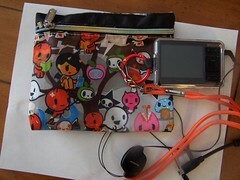 The MP3 audiobooks worked fine from it and both kinds work fine from the regular storage. It is nice that it will play both since I can download both versions from our library and not all audiobooks come in both versions. There is a lot more information on the Zen that you can view on the Creative Zen 4 GB Portable Media Player (Black) page. Just look through the customer supplied images. They show many different functions and have descriptions that describe the Zen thoroughly. To get the media from the PC to the Zen, the easiest way is to attach the Zen and go to Explorer. The Zen shows up as My Zen. Go into Storage Media and the different folders relate to the different options on the Zen. This is an example of my audiobooks that I had copied to my Zen. Click on the image to get a full size view. Most people have downloaded audio files to an MP3 player, but it is a little different getting video content. To see how to download content such as movies, etc. to your PC and then to your Zen, see my upcoming/next post. Tagged audio, creative, gear, mp3, player, portable, tech, toys, travel, video, wma, zen. Bookmark the permalink.